Business and Creativity: No Hope for Shepard Fairey? No Hope for Shepard Fairey? 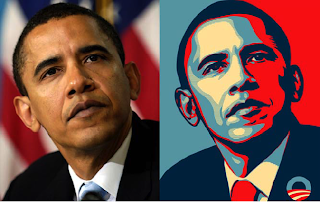 The Associated Press (AP) has decided to sue street artist Shepard Fairey for the use of an Obama photograph takeN by the company in 2006. Fairey used the photo to create a piece of art titled 'Hope' which became a modern campaign image for the election in 2008. Fairey claims that his alterations are fair use and the his creation is different enough from the picture. AP claims that Fairey earned over $400.000 from merchandise of this picture from the sales of t-shirts, buttons and posters. The problem here is AP is trying to protect its copyright and Fairey has not earned a penny from the photo alteration since he donated all of the money to charity.
" I am disappointed the Associated Press is persisting in its misguided accusations of copyright infringement. I believe that my use of the Mannie Garcia photo as a reference, which I acknowledged off the bat as an AP photograph, falls under “fair use” provisions laid out in the law. My entire purpose in creating the poster was to support Obama and help get him elected." said Fairey in an interview. I believe AP is not trying to get any money from Fairey, rather make a point about the wrong use of content without permission. If the photo had been under the creative commons license, this wouldn't be a problem. I do think that Fairey could have given the right credits to the original photo on his website for legal reasons.